Powers/Abilities: Scientific genius. Able to deploy a variety of monsters at his command. History: Grimly Feendish was a supervillain who sought to conquer the world, using both his monsters and bizarre plot devices, such as exploding treacle, to do so. He was usually thwarted by Eagle-Eye, Junior Spy. At one point Grimly started Doomsday School for young monsters across the road from Eagle-Eye's school, Conker Crescent High. 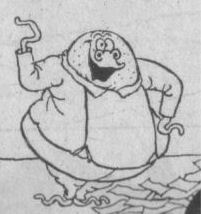 One of the students at Doomsday School was Grimly's nephew, Fred Feendish, who became friends with Eagle-Eye and would sometimes try to warn him of his uncle's schemes. 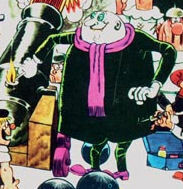 In the early days of his career, Grimly had high ambitions, and was considered a criminal mastermind by Eagle-Eye and his agency, but as time progressed he began setting his sights on more mundane targets, dreaming of robbing the Bank of England but being content to spend most days committing very small scale and petty crimes. Late in his career Grimly became a proud parent, working with his son Sylvester. Thanks to Paul Muir for providing information and images. Doug Sulipa of Comic World notes "Grimly Feendish appears as a villain in the Wham! comics series "Eagle-Eye Junior Spy" (2 pages in each issue). He was more popular than the main character in Junior Spy. 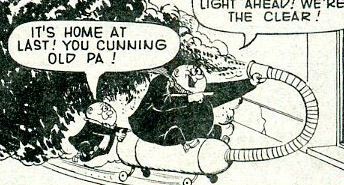 Grimly Feendish was an Addams-Family-like character; Fred Feendish (nephew of Grimly) also occasionally appears. He was eventually awarded his own comic strip as Grimly Feendish: The Rottenest Crook in the World! in other UK comics; (Smash! & some UK Annuals). 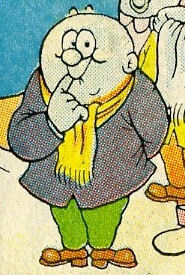 Leo Baxendale's Grimly Feendish character from looks a lot like the Uncle Fester character from Addams Family. Baxendale had apparently written for the New Yorker a few of the jokes that Addams had drawn; Uncle Fester might have been the inspiration. 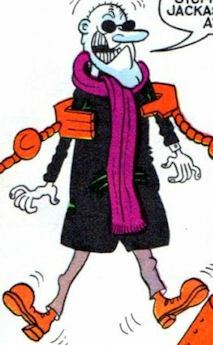 Grimly Feendish, now a cult favorite character, was the subject of a song of the same name by The Damned in 1985. Apparently Neil Gaiman was involved in a modern Grimly Feendish short story project, but I am unsure where it was printed. These issues of Wham! all which feature Grimly Feendish as the Villain in "Eagle-Eye Junior Spy": #4, 6, 8 through 17, 32, 33, 83, 88, 93, 98, 100 through 103, 105, 106, 107, 121, 124, 125, 127, 132, 133, 139, 148, 149, 150, 152, 153, 159, 160, 164, 168, 169, 170, 171; other issues may include him, but the following are confirmed as having no Grimly Feendish appearances: WHAM #5, 18, 20-22, 25, 26, 34, 84, 91, 92, 111, 112, 115, 117, 118, 123, 136, 137, 141, 144-146, 162, 163, 165-167." He graduated to his own strip in Smash!, appearing in issues #1 (February 5th 1966) through #162 (8th March 1969), when the title was revamped by new owners IPC. After his run in Smash! 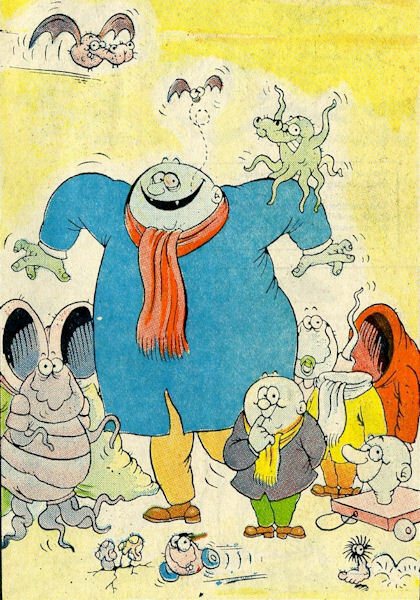 ended, Grimly resurfaced in Shiver and Shake starting with #22 (August 4th 1973), both in his own strip and, as of #24, as part of the Shiver Givers, the name given to the various monsters whose strips populated Shiver, the horror part of Shiver and Shake, and who appeared together as the staff of the Shiver half of the comic; even among the ghouls and ghosts, Grimly proved himself not to be a team player, being caught stealing from his fellow monsters on a few occasions. The first eleven issues of Shiver and Shake that Grimly appeared in simply reprinted his Smash! strip, but from #34 he began getting new material. His run ended with issue #77, having skipped only three issues - #63, 72, 76 - during that time. He also appeared in some of Shiver and Shake's Summer Specials. It's worth noting that Grimly's ambitions rapidly scaled down when he moved from being the antagonist in Eagle-Eye's strip to being the star of his own, with him going from a potential world-conqueror to a much more petty crook, albeit one with the odd large ambition. His sights went even lower when he joined the Shiver Givers, as he got caught stealing office stationery. Of course, if you feel inclined to explain such things, rather than just going with the flow of the humour strips, then maybe we were seeing his career in reverse. We met a few members of Grimly's family over the course of his run. As well as his law-abiding nephew Fred, who was a pal of Eagle-Eye, there was Grimly's eager-to-please son Sylvester, and Grimly's American cousin, the slimmer but equally nefarious Aloysius Twitty (pictured right), who appeared in Smash! Annual 1967. Grimly was pale white when first introduced in Eagle-Eye's colour strip, and he stuck with that through his run in Smash! 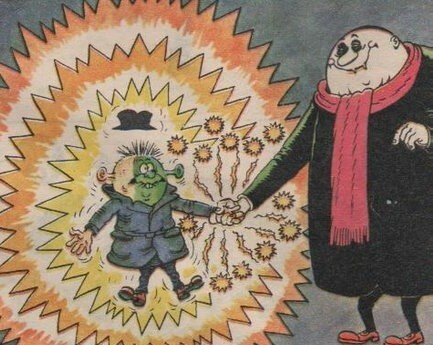 However, as his main image above shows, he was coloured a light green when he got his own poster in Shiver and Shake #54. 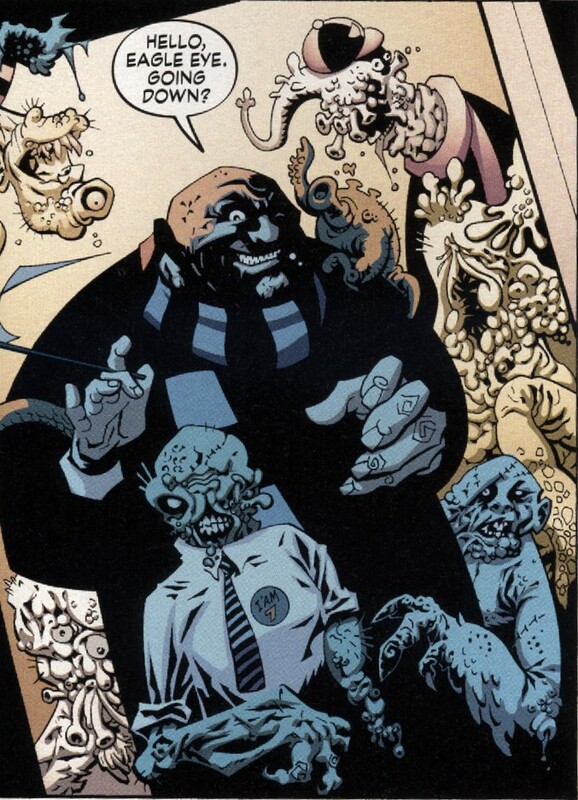 Grimley reappeared as part of a massive ensemble cast of British characters, and his true name was finally revealed, in Wildstorm's Albion. Rock group The Damned named a single after Grimly Fiendish (sic) in 1985.